Deluxe Jewel Case edition w/ Bonus Track! Blasphemy and disgrace from the MASTERS of raw Satanic DEVIL METAL DEATH! Raw & Violent METAL in the spirit of Possessed, Hellhammer & Venom! Long awaited second album with bonus track, all new exclusive cult artwork/layout & killer deluxe booklet. 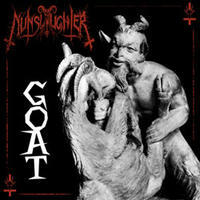 If you're not familiar with NunSlaughter you know NOTHING about Death Metal! "Thou Art In the Kingdom of Hell" lyrics written by Jeff Becerra of mighty POSSESSED! Burning the flame of True Satanic DEATH METAL since 1987!